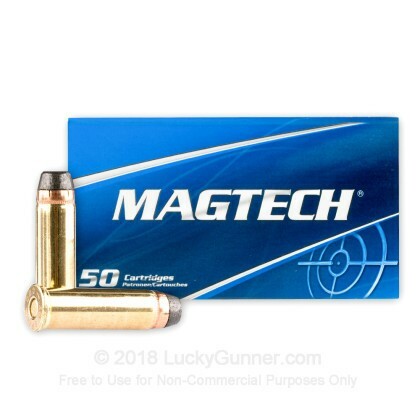 Magtech is an ammo company based out of Brazil and has been around for over 80 years. Their parent company, CBC, is the largest provider of military ammunition in Latin America. They also own the popular European ammo company, S&B. 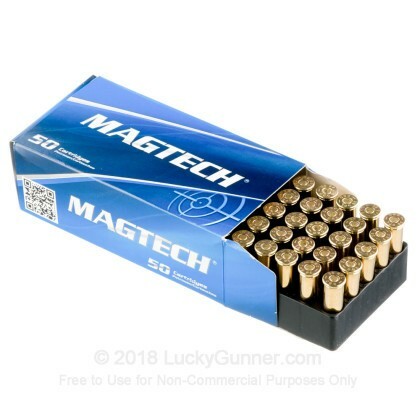 Magtech is not quite as popular here in the US, but in other parts of the world they have a strong reputation for making quality, reliable ammo for a number of different shooting applications. Magtech offers several different 38 Special loads, and the one we tried out for this video is a 158 grain, semi-jacketed hollow point. The case is reloadable brass with a non-corrosive primer. 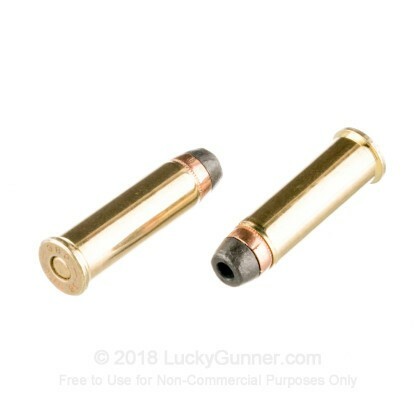 The bullet is a traditional lead core with a copper jacket that partially encloses the bullet, leaving the lead on the top exposed with a hollow tip. 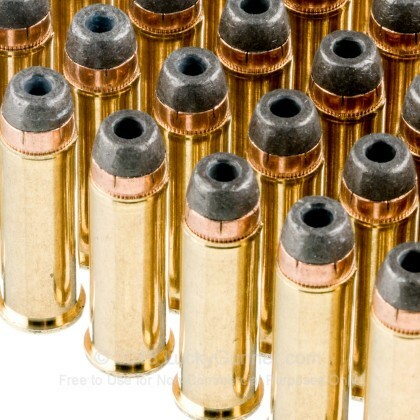 This bullet type is intended to expand on impact, but in a standard 38 has limited utility. It's better than a full metal jacket for hunting or self-defense, but far inferior to most +P loads. It does offer lower recoil than more effective rounds, so it might be a good choice for small framed revolvers or people who are recoil sensitive. We ran a couple of boxes of this ammo through six different guns to see how it would perform. We used five revolvers and one lever action rifle. Magtech is known for using slightly harder primers in their ammo, but this usually isn't a problem for unmodified guns. For this particular load, we didn't experience any light strikes, even in our modified Smith and Wesson 686. However, this has been a problem in the past, so just be aware that Magtech ammo might not be the best choice if your revolver has extra light springs installed. Extraction was smooth in all the revolvers, and the Marlin 1894 carbine fed every round smoothly. Recoil was light to moderate and on par with most other non +P 38 Special loads. 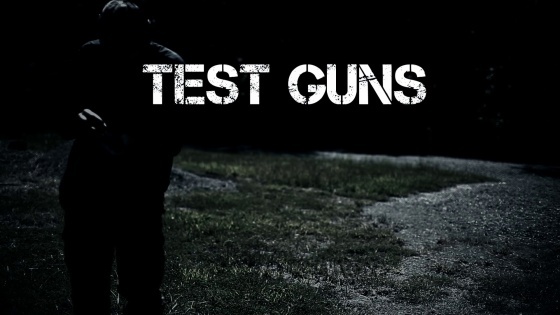 We tested accuracy from the bench at 25 yards with a carbine. The 10 shot group was hitting just low and right of the point of aim, with a respectable two-inch pattern. It's easy to overlook Magtech, with so many other more common brands out there. But in my experience, it's always been dependable ammo in any pistol caliber. 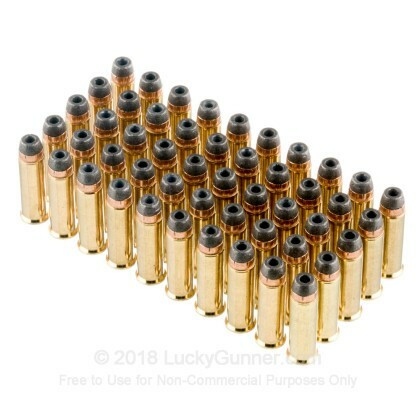 This 38 Special load is affordable enough to be used for practice on the range and could be marginally effective for self-defense or hunting. 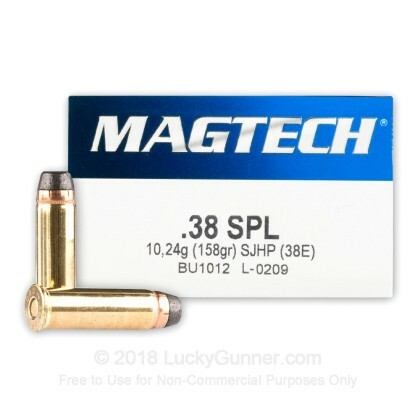 We also have this 38 Special - 158 Grain SJHP - Magtech - 50 Rounds ammo in stock in a smaller quantity.